Lulu's Story: A post a day keeps the doctor away!!! I'm gonna try to write somethin every day of November and all the way up to my birthday just like mommy!!!! Yesterday was Halloween. I had TWO parties. One at my Aunt Roses House. A meet and greet and I got presents, the other one at Tee Tee Alison's and I had potatoes and cake!!! It was very fun and I was a bumble bee!!!! And there Miss Lulu! Glad you enjoyed both parties! 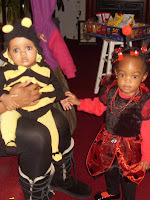 You a Bumblebee and Babysongbird a ladybug---I can just imagine what fun you too would have in a garden. Enjoy each day of blogging up to your Big Day!!!! Well a/b time Ms. Scotland! I cant wait to read your daily post. BTW, you look really cute in your snazzy bumble bee outfit!